We cant be certain exactly what happened that night, but maybe it was something like this. He pulled up the stakes of his tents, and he and Rachel and Leah and their 12 children packed up all their belongings and loaded them onto a caravan of camels. And with all their servants, and their great flocks of sheep and goats and camels, they were traveling back to the land of Jacobs father. They were a few days into their journey when they made camp for the night. That night they had visitors, they were messengers from God. Youre brother Esau is coming to meet you, they told Jacob. Esau is coming to kill me! Jacob said. When they were kids, they probably got into lots of fights - and Jacob probably always got pounded, because his older brother (by about five minutes! Remember, they were twins - but not identical twins at all) was bigger and stronger than he was - but for some reason that never seems to stop little brothers from getting into fights with their bigger brothers and sisters! Thats where Jacob must have learned it was better to be clever. Of course, its not like they were going to end up wrestling on the ground or anything - they were both over a hundred years old by now! But Esau was a powerful, wealthy prince. He had many strong and mighty men who served him - and he was coming to meet his brother. ..or kill him. At least, that was what Jacob was afraid he was planning to do. And so Jacob came up with a plan to make peace. He is coming to kill me! Jacob cried. And so he divided his household into two groups, That way, if my brother attacks one group, the other may be able to get away. he said. And then, for the first time in his life, Jacob prayed to God. God of my fathers, please hear my prayer! You told me to go back to the land of my fathers, and that you would make everything go well for me. I came across the Jordan River with nothing but a walking stick, and now, look how rich you have made me! I am not worthy of all the kindness you have shown me. And then Jacob went through his herds and chose gifts for his brother Esau. He chose goats and sheep, donkeys and cows, and camels. A good camel was worth more than a good car back in those days. A REAL good camel was like a Mercedes Benz! In the desert, it was probably the most valuable thing you could own. That way, Jacob hoped that Esau would forgive him. That night Jacob and his family came to a small stream. Jacob sent his family across the stream to make camp, but he stayed on the other side. He was afraid. He felt like running away. Under a starry sky, he sat next to a small fire, with his head down in his hands. What am I going to do? he said. And thats when a stranger stepped out from the darkness. What do you want? Jacob said to the stranger. You asked for my help, the stranger said. Go away! Leave me alone! Jacob said. Somehow, Jacob knew the stranger was the angel of God. It was God himself, in the form of a man. My uncle hates me, my wives cant get along, and my brother is coming to kill me. A lot of help you have been! Jacob said, and he tried to push the stranger away. But the stranger grabbed a hold of Jacobs robe. Go away! 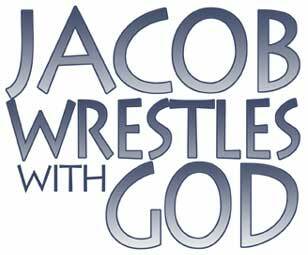 I dont need your help! Jacob said, and the two of them began to wrestle to the ground. The stranger wouldnt let Jacob go. But without me, you have nothing at all, the stranger said as they struggled back and forth. All right then, the stranger said, and he began to pull away (but he didnt let go of Jacobs robe). No! Wait! You cant leave me here all alone! And now Jacob was grabbing a hold of the stranger, and he wouldnt let him go. But the stranger just held on all the tighter. You need me, the stranger said. I dont need you! I dont want your help! Jacob said. But deep down inside, deep in his heart, he knew that that was what he needed most. He tried to push the stranger away, but he couldnt let him go. And so they wrestled back and forth, on and on, all night long. Jacob wouldnt let the stranger go, and the stranger wouldnt let Jacob go. Finally, the early light of morning began to creep across the eastern sky. And he wouldnt let God go. At last, God struck Jacob on the hip and put it out of joint. Jacob walked with a limp from that day on. It would always remind him of the night he wrestled with God. And then God said to Jacob, What is your name? A strange question to ask after all of this! You know who I am! Jacob said. I am Jacob! Jacob answered. But thats not who Jacob was anymore. He was not a cheater anymore. Now Jacob knew that everything he had came from God, and not from his own doing. And so God gave him a new name, a princely name. That night, Jacob learned the most important lesson of his life. Grab hold of God, and never let him go.